The role of the consumer in the gas market should change. Ukraine needs to separate the functions of Naftogaz ещ the extraction and transportation of energy resources and provide access to its pipelines and other infrastructure objects to third parties, said a member of the European Commission, Support Group for Ukraine, Team Leader Energy & Environment, Torsten Woellert, told the VII National Expert Forum, organized by Gorshenin Institute. 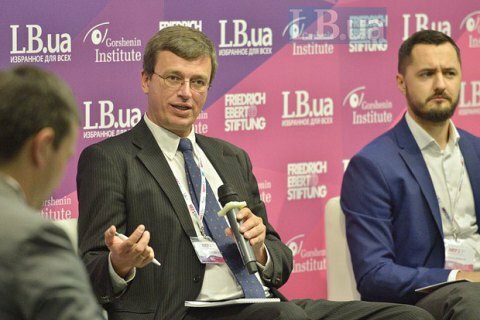 "The legislation on the gas market is the best in the whole energy sector in Ukraine. However, the functions of Naftogaz need unbundling (to be separated). It needs to be done without steering an unnecessary politicization: it is a structural thing and a key part of energy security. In the end it will lead to a change in the role of consumers in the market [by enabling consumers to choose suppliers]," Woellert said. He also recalled the need to create a national energy efficiency fund as soon as possible, which will increase the energy efficiency of buildings and stimulate the development of energy-saving technologies. The Memorandum with the International Monetary Fund, promulgated by the Ministry of Finance, refers to Ukraine's commitment to adjust social norms during off-peak months and introduce a capacity-based tariff for gas distribution and heating. In addition, the memorandum envisages the delineation of fees for gas as a commodity and payment for the service for its delivery in line with the requirements of the "third energy package" for the Energy Community member countries.